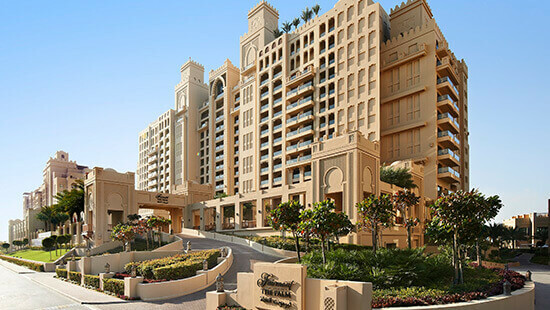 Named after the iconic Palm Jumeirah, Fairmont The Palm is the perfect luxurious family resort in Dubai that offers lavish rooms and suites overlooking the Arabian Gulf and the Dubai Skyline. Guests can celebrate the finest flavors with a choice of world-class restaurants and lounges, including; Brazilian “Frevo”, Mediterranean “Seagrill Restaurant and Lounge”, international “Flow Kitchen”, hand crafted patisserie “Delicacy”, 24 hour lobby lounge “Masharabiya Lounge”, quintessential bar and lounge “The Cigar Room” and an interactive cooking studio “The Chefs Palette”. 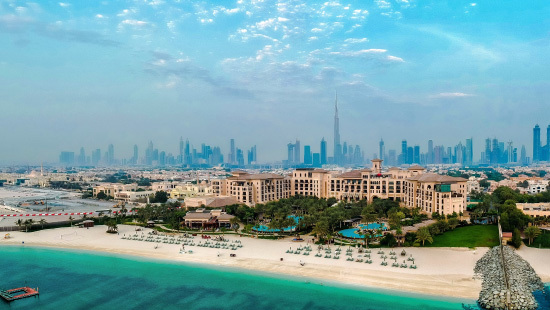 Bringing chic yet family-friendly style to dynamic Dubai, Four Seasons Resort Dubai at Jumeirah Beach is a green oasis beach resort. Providing exceptional service, it is perfect for families wishing to experience everything Dubai has to offer. Set on a private beach, the resort offers the most convenient access to downtown shopping and leisure attractions like Dubai Parks and Resorts. In the 237 ultra-spacious guest rooms, the decor blends Arabic design with cool, contemporary style, creating an atmosphere of light, airy luxury. 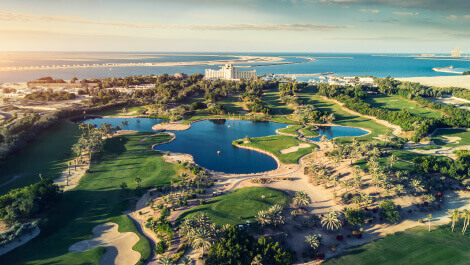 The award-winning Dubai’s only true beach resort, JA Jebel Ali Golf Resort, features two beach hotels: JA Palm Tree Court and JA Jebel Ali Beach Hotel. Located just 10 minutes from Dubai Parks & Resorts, this fabulous Dubai resort features a palm-lined private beach, temperature-controlled swimming pools plus 15 restaurants and bars. It also offers a 9-hole golf course, spa, kids club, horse riding stables, and a marina. It’s also a great choice if you’d like an all-inclusive beach holiday. Jumeirah Al Naseem invites the outdoors in with lush gardens and sandy beaches providing pockets of privacy and peacefulness. The 387 rooms and 43 suites are spacious and open plan, and accented with Arabian touches. From the balconies and extended terraces, there are spectacular views of the sea, the resort's landscaped gardens, swimming pools and Burj Al Arab Jumeirah. The hotel features over 40 world-class restaurants, bars and lounges, its own beach club and the eclectic offerings from Madinat Jumeirah. Designed in the style of a Sheikh’s summer residence, the hotel replicates traditional royal architecture, coupled with luxurious modernity. 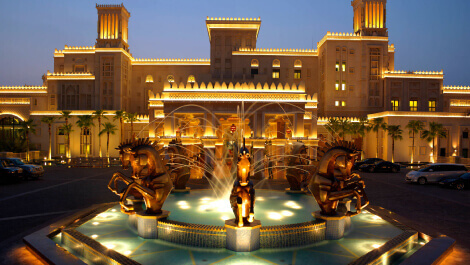 Guest rooms feature private balconies with views of the resort, along a tree-lined avenue, adorned with beautifully sculpted Arabian horses, the hotel will take your breath away. As part of the magnificent Madinat Jumeirah Resort, Jumeirah Al Qasr offers all the facilities and activities of the wider resort. World-class restaurants, bars and cafes, Talise Spa and Fitness, a traditional souk housing scores of boutiques, shops and galleries. 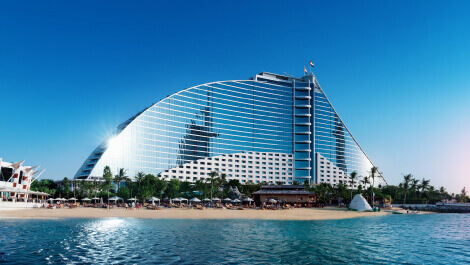 Inspired by the shape of a breaking wave, Jumeirah Beach Hotel is a vibrant symbol in Dubai’s skyline and a destination synonymous with sophistication and luxury. Resort-inspired interiors offer modern comfort and unparalleled relaxation within 599 rooms and suites, as well as 19 exclusive beach side villas. With over 18 restaurants and bars, Kids Club, 6 swimming pools, 7 tennis courts, a relaxing spa and healthclub, a private beach and lots more making Jumeirah Beach Hotel a resort for the whole family. Set amongst tranquil gardens, waterways, exclusive pools and Madinat Jumeirah’s private beach, the intimate and exquisite summerhouses of Jumeirah Dar Al Masyaf offer newly refurbished elegant and spacious guestrooms and courtyards, personalized and generous butler service and an understated Arabian luxury experience. These summerhouses offer an exquisitely designed hideaway – the premium accommodation at the Madinat Jumeirah Resort – The Arabian Resort of Dubai. 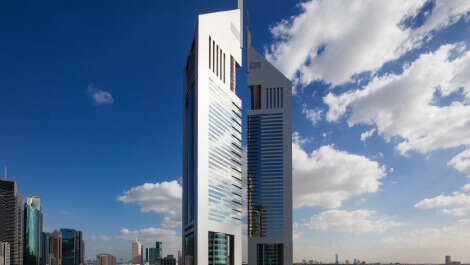 A sleek architectural masterpiece, Jumeirah Emirates Towers has created its unique legacy by delivering exemplary experiences to today’s global citizens. Comprising of two equilateral triangles, this landmark structure is home to 400 spacious rooms and suites, 11 restaurants and bars, including award-winning, world-class restaurants such as The Rib Room, and Al Nafoorah, Talise Fitness, Talise Spa as well as extraordinary shopping and lifestyle attractions at The Boulevard, a unique and prestigious retail destination. Meaning 'Harbour of Peace', the hotel forms the gateway to Madinat Jumeirah Resorts and is a luxuriously charming boutique style hotel. The spacious 292 guest rooms are beautifully furnished, with private balconies overlooking the sea, offering authentic Arabian experiences on a beach front location with family friendly service. 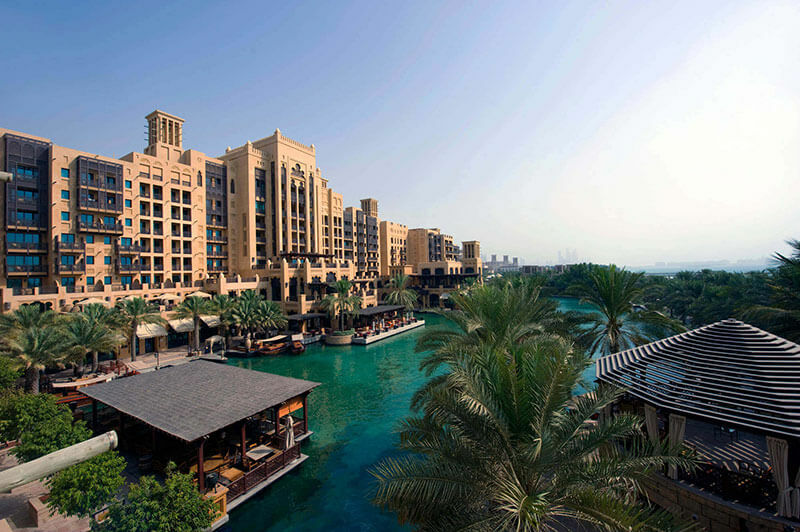 It’s the entry point from which numerous waterways and walkways thread their way to all corners of Madinat Jumeirah Resorts and its wide array of facilities. 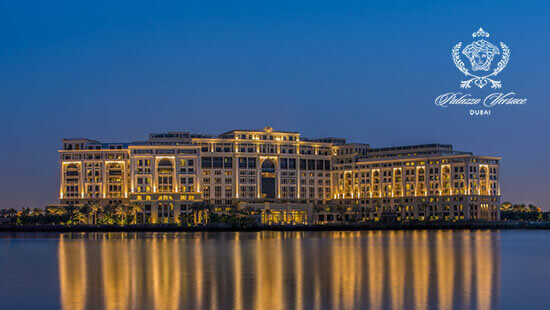 You’ll see just how much is on offer – and why this luxury resort is the jewel of Dubai. Indulge in a timeless culture of hospitality inspired by the ancient palaces of Turkey featuring hand-painted Turkish artworks and murals that conjure up the Golden Age of the Ottoman Empire. 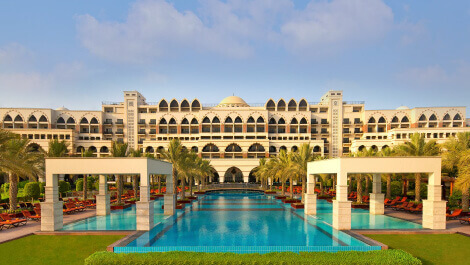 This spectacular beachside resort is located on the West Crescent of the exclusive Palm Jumeirah in Dubai and offers exhilarating views of the Arabian Gulf and Dubai’s impressive skyline. The resort has 405 elegant guest rooms and suites with stunning sea views and 38 Royal Residences. 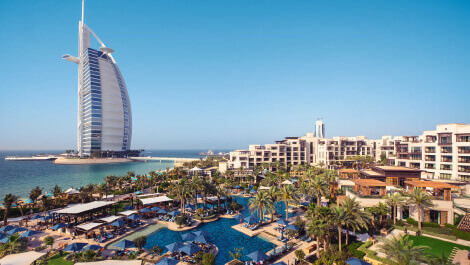 Enjoy our infinity pool, Sinbad’s Kids Club, and the private beach, or unwind with a treatment at the award-winning Talise Ottoman Spa and dine across over 9 restaurants and bars..
Mövenpick Hotel Jumeirah Beach is situated in the heart of Dubai’s most dynamic and lively seaside district. The hotel is only few steps away from the stunning Arabian Gulf beaches and just a short walk from “The Beach” mall. This 5-star hotel is modern, chic and contemporary, with exciting dining and recreational options. 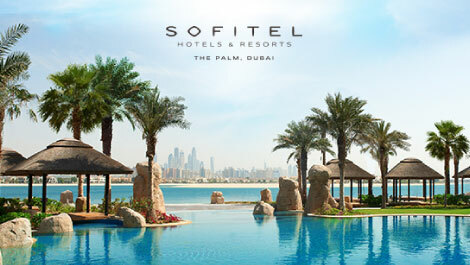 Be captivated by a fresh blend of Polynesian-inspired architecture and Arabian hospitality at Sofitel the Palm, Dubai in the iconic setting of Palm Jumeirah. A welcoming haven of paradise, this stunning resort overlooks the enticing waters of the Arabian Gulf, offering a relaxing retreat, enthused with elegant luxury for an unforgettable stay. Combining understated luxury with utmost comfort, all guest rooms show­case onyx laden bathroom features, deluxe French amenities along with Sofitel’s MyBed™ concept – an all-feather bed and extra light down duvet. Guests can treat themselves to rooms, suites villas or serviced apartments ideal for families with children or for lengthier stays. Reminiscent of a 16th century Italian Palace, Palazzo Versace Dubai is a Neoclassical masterpiece with subtle traces of Arabian architecture. Featuring a striking entrance, high ceilings, landscaped gardens, and a range of well-crafted Italian furnishings, the hotel is truly symbolic of the Versace lifestyle. Set in the heart of the Culture Village, less than 15 minutes away from Dubai International Airport and 8 minutes away from Burj Khalifa and Downtown Dubai. 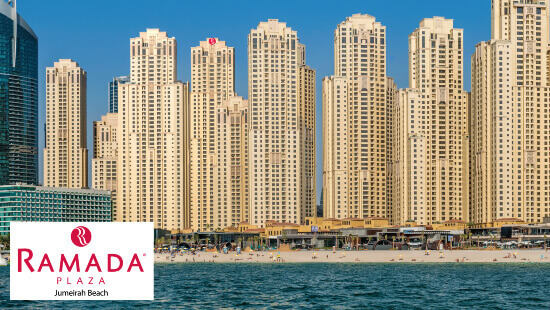 Ramada Plaza Jumeirah Beach is conveniently located in one of the most vibrant destinations in Dubai located a mere walking distance to the lively district of The Walk JBR, Dubai Marina and Jumeirah Beach boasting 360 spacious hotel rooms, apartments and suites. For food lovers our five distinct restaurants and bars are serving globally inspired cuisine. Whether you are a business traveler or looking to spend a family holiday, a short break or a long stay, Ramada Plaza Jumeirah Beach is guaranteed you to have a memorable experience.